Rheumatoid arthritis (RA) is a chronic inflammatory disease that can affect various organs and tissues of the body, but shows a clear preference for the joints. We give the name of arthritis inflammation of one or more joints. A joint arthritis appears swollen, red, hot and extremely painful. When only one joint is inflamed, it is called monoarthritis. When inflammation occurs in several joints it is a polyarthritis. 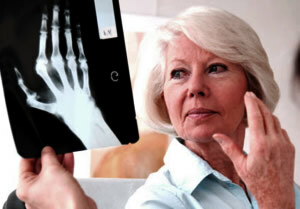 Arthritis can also be symmetrical when it affects simultaneously two pair joints such as knees, wrists, ankles, etc. The linkage is the region where there is a connection of two or more distinct bones. Examples: knee, elbow, wrist, ankle, shoulder, etc. The joints along the body are not equal. Some joints are connected by a fibrous tissue, a bone sticking to each other, making the structures, such as skull, others are connected by cartilage and allow a small mobility as vertebral discs that join the vertebrae of the spine; there is also the movable joints, which are typically linked by a cartilage and a bag filled with liquid (synovial fluid), allowing large movement of the bones with a minimum friction between them, such as knee, elbow, shoulder, etc. 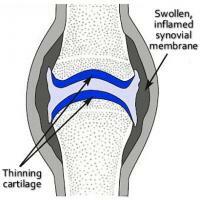 When there is an inflammatory arthritis? 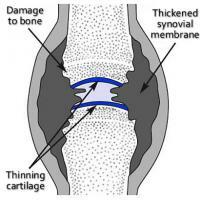 When the joint is painful but clinical signs of inflammation (swelling, heat and redness) it is called an arthralgia. 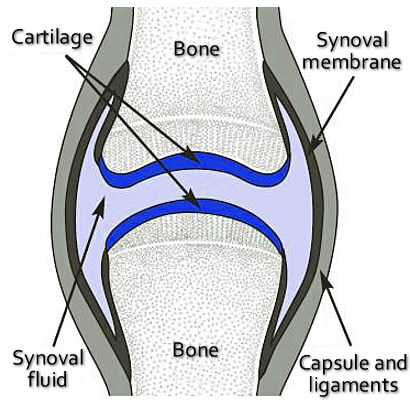 A feature typical of joint inflammation of rheumatoid arthritis is the involvement of the synovial tissue, tissue filled with liquid which is situated in the center of the joints, serving to reduce friction between the bones, as a kind of lubricant. It is not known what causes rheumatoid arthritis, but autoimmune factors are present. Why the body attacks its own joints is still a mystery, but the end result is tissue destruction by the immune system. Genetic factors seem to be important of the presence of certain genes, which is associated with an increased risk of developing the disease. 1st degree relatives of patients are 3 times more likely to have RA. Rheumatoid arthritis is more common in women and in Caucasians (whites). The peak onset of the disease is between 30 and 55. Up to 5% of women over 65 have RA. The act of smoking is associated with an increased risk of RA and greater severity of illness. The nulliparity (childlessness) also appears to be another risk factor. The picture of rheumatoid arthritis usually starts insidiously, with mild and very specific symptoms such as fatigue, muscle pain, weight loss, fever, tingling hands, and sometimes small joint pain. It is very common to have symptoms for several months and seek medical attention. 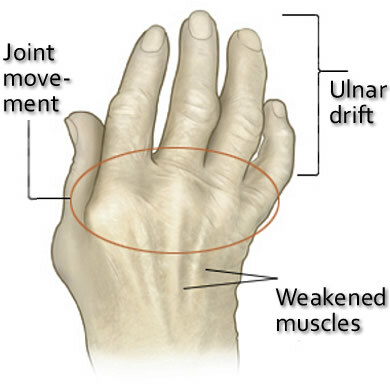 When the frame of arthritis starts it is typically a symmetrical polyarthritis. The joints of the hands are usually the first to be affected. The main ones are the metacarpophalangeal and proximal interphalangeal (see the illustration). As the disease progresses, more joints are affected. 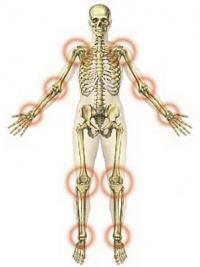 Wrists, shoulders, knees, feet, ankles, spine, jaw joint, hip, and others may be attacked by the immune system. The symptoms may be cyclical, alternating periods of improvement with time of great worsening, or continuous. If left untreated, deformations can occur over time. A typical lesion of RA deforming lateral deviation of the fingers is associated with a deformity called a gooseneck. 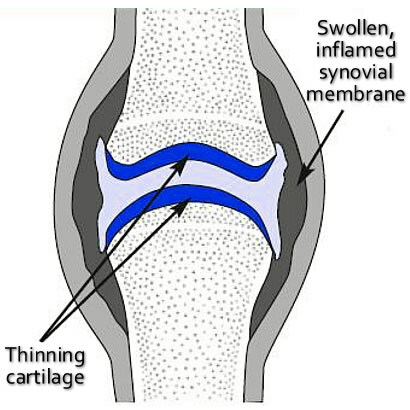 The involvement of the joints is typical, but rheumatoid arthritis is a systemic disease that can also occur with inflammation of the pericardium (sac surrounding the heart), inflammation of the lungs and pleura, eye inflammations, lesions in peripheral nerves, spleen enlargement, signs of vasculitis and formation of subcutaneous nodules, mainly in the forearm and elbow (see the photo below). Patients with rheumatoid arthritis are at increased risk for myocardial infarction. Rheumatoid arthritis is also a risk factor for carpal tunnel syndrome. The American College of Rheumatology established criteria for RA. To make the diagnosis the patient must have at least four of the seven criteria below. The criteria 1-4 must be present for at least 6 weeks. These criteria serve only to patients with fully established disease. As already mentioned at the beginning of the frame, these symptoms may not be present. 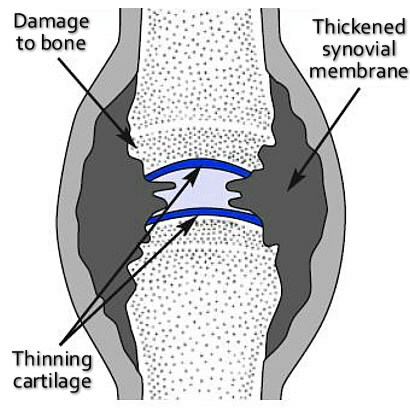 Arthrocentesis is the collection of synovial fluid through a needle puncture inflamed joint. This test serves to evaluate the composition of the synovial fluid and discard other causes of arthritis. Arthrocentesis can also be used to inject medication to relieve arthritis. Up to 80% of patients with rheumatoid arthritis test positive Rheumatoid Factor (an autoantibody). This antibody alone, however, is not sufficient to establish the diagnosis. Other diseases such as lupus, sjogren and cryoglobulinemia may also have positive rheumatoid factor. In addition, up to 10% of the healthy population can have a positive result but may not necessarily have a disease. A new antibody was discovered recently. This is the anti-CCP. This antibody is more specific for rheumatoid arthritis, the rheumatoid factor, and up to 95% of patients with RA have a positive result. When the auto-antibodies are present, there is a greater risk of more severe disease and crippling. ANF can be positive in 40% of cases. This is an antibody that helps a little in the diagnosis of rheumatoid arthritis because it tends to be positive in several other diseases that go with arthritis, and therefore can be part of the diagnosis. However, it serves to suggest the presence of an autoimmune disease as the cause of the symptoms. There is no cure for rheumatoid arthritis. Treatment is aimed at reducing the inflammation and preventing deformities. The non-pharmacological treatment includes controlled exercise, physical therapy and nutritional counseling to prevent overweight and controlling cholesterol. There is no specific dietary RA. Drug therapy is the main treatment of rheumatoid arthritis. There are four different classes of drugs that can be used according to the severity of the disease. These drugs relieve the symptoms of arthritis. The most commonly used are ibuprofen and naproxen. It is taken 2-4 weeks to reach maximum effect. It has many side effects when used for a long time and do not prevent severe deformation in the joints. This is the class of drugs able not only to reduce the inflammatory process of arthritis, but also to prevent disease progression. The main drugs in this group are hydroxychloroquine, methotrexate, gold salts, penicillamine, sulfasalazine, azathioprine, leflunomide and cyclosporine. Many of these immunosuppressive drugs should be used under strict medical control. 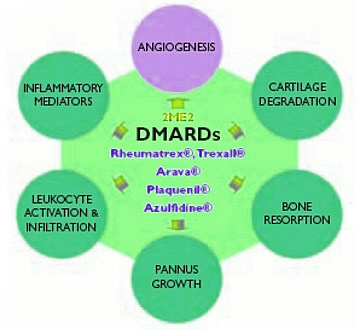 The effects of DMARDs are felt only after some weeks / months of treatment. 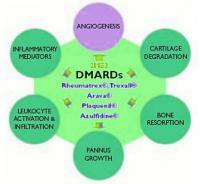 They are the newer group of drugs for rheumatoid arthritis. These drugs act directly on inflammatory mediators and cells involved in arthritis. They also have an immunosuppressive effect. Its action is faster than the DMARDs, appearing as early as two weeks. However, these are expensive drugs, which annual cost is $15,000. So, they are reserved for more severe cases, unresponsive to conventional therapy. They are all injectable drugs, that's why it complicates their use at home. Drugs such as prednisone act quickly reducing inflammation and relieving symptoms of rheumatoid arthritis. It can be taken orally or injected directly into affected joints. Its ability to prevent deformities is restricted and its side effects are numerous. Its use is indicated at the beginning of treatment, usually along with NSAIDs for a rapid relief of symptoms while waiting for the full effect of DMARDs. So far none of the so-called alternative treatments could prove superior to the placebo effect. Medicines like collagen or shark cartilage do not present any evidence that they work. All work with homeopathy and acupuncture failed to show any benefit with the use of these therapeutic modalities. Magnetic bracelets are also good for nothing. My son, when he was 15 years old, startsd suffering pains under the knees. The doctor said it was the illness of Shlatter. He advised to stop running and playing football. Now my son has bumps under his knees. When he by accident strikes them, his legs ache. Can it be the beginning of arthritis? Has anybody heard about a new way of treating Arthritis?It is with the use of ultra-low temperatures. When the patient is placed into a special cooling chamber where the temperature is below 160 degrees Celsius. The procedure lasts for about 3-5 minutes, treatment is usually 10 procedures. You are writing about treatment with Ibuprofen. My dog had problems with its legs and the vet prescribed Ibuprofen, but he warned me, that this medicine affects your stomach, and can't be used for a long time. And what about people? Or our stomachs are stronger? Has anybody used the tablets of Arcoxia for treating Arthritis? Accidently found some information on the Internet - it seems a good medication, kills pain, treats arthritises, osteoarthritis, spondilitis. But are there people, whom it really helped? It wouldn't be desirable to throw out money.